The Coma Cluster is a group of galaxies in the faint constellation Coma Berenices, visible in medium to large amateur telescopes. Galaxies in a cluster roughly 300 million light years from Earth could contain as much as 100 times more dark matter than visible matter, according to an Australian study. The research, published today, used powerful computer simulations to study galaxies that have fallen into the Coma Cluster, one of the largest structures in the Universe in which thousands of galaxies are bound together by gravity. “It found the galaxies could have fallen into the cluster as early as seven billion years ago, which, if our current theories of galaxies evolution are correct, suggests they must have lots of dark matter protecting the visible matter from being ripped apart by the cluster.” Dark matter cannot be seen directly but the mysterious substance is thought to make up about 84 per cent of the matter in the Universe. He says the galaxies appear to have stopped making new stars when they first fell into the cluster between seven and ten billion years ago and have been dead ever since, leading astrophysicists to label them “failed” galaxies. This end to star formation is known as “quenching”. “Galaxies originally form when large clouds of hydrogen gas collapse and are converted to stars—if you remove that gas, the galaxy cannot grow further,” Yozin says. 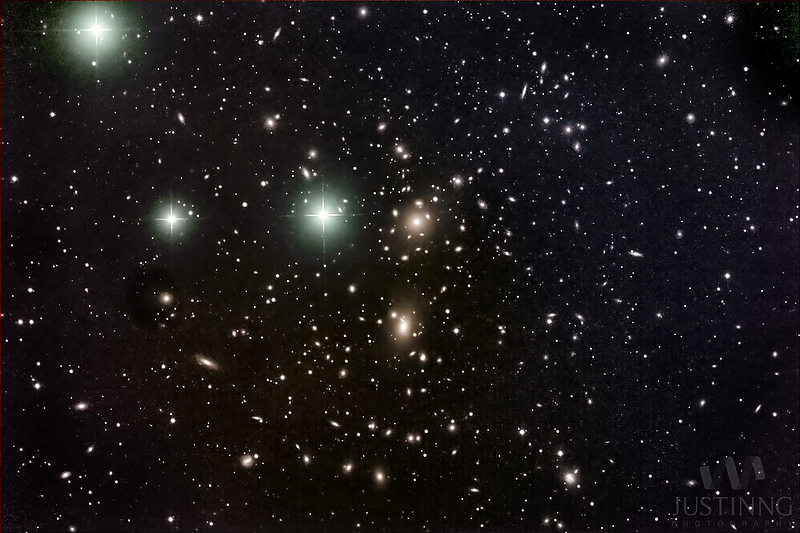 The Coma Galaxy Cluster is a massive cluster of galaxies in the constellation Coma Berenices. Each point of light in this image may look like a star but in fact they are, mostly galaxies. With over 650 galaxies in the cluster, Abell 1656 is one of the densest collections of galaxies in the entire sky. Credit: Greg Parker, New Forest Observatory.